The U.S. Department of Energy earlier this summer commissioned a study purportedly about grid reliability. In reality, it’s more likely the study is a fishing expedition searching for ways to buttress fossil fuel contributors to and allies of the Trump administration — folks squeezed by competition from less costly wind and solar power. Luckily, the expedition for the imaginary renewable reliability liability seems to have run aground on reality, according to a leaked draft of the report (final report here). 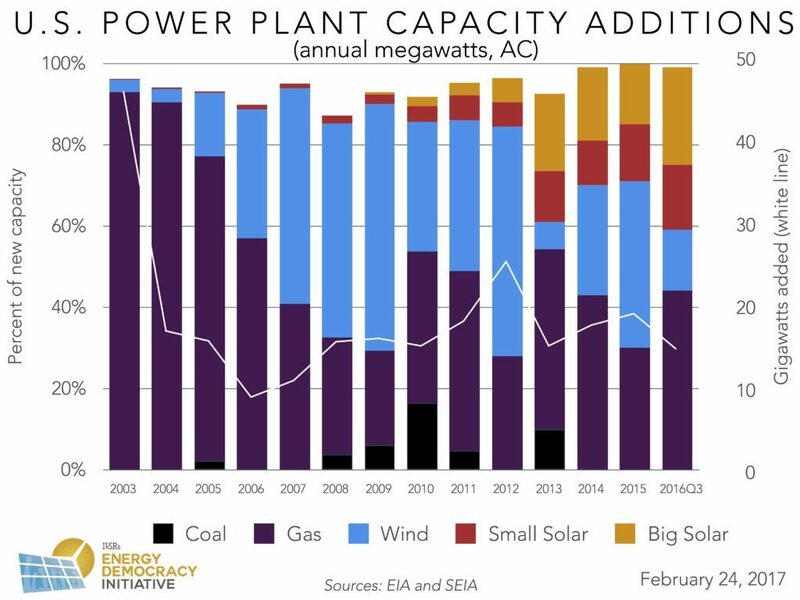 Rather than implicate renewables, it shows that low prices drove utilities into the arms of gas power plants and away from coal and nuclear power (it still has plenty of insinuations about renewable energy). While this study will hopefully end the futile effort to find a clean energy scapegoat for the struggles of large-scale, non-renewable power plants, it doesn’t erase a longer-range issue for electric utilities across the U.S.: big, old power plants and new fossil-fuel power plants are equally ill-equipped to compete in a 21st century electricity system. The fantasy of the Department of Energy study was finding a way to turn back the clock on renewable energy, missing its key advantage: since wind and solar have no fuel costs, they are always the cheapest electricity in the market. No matter how low the operations costs of a coal or nuclear (or gas) power plant, they need fuel. And it’s virtually impossible to find any supplier of coal, uranium, or gas who can compete with zero. Plus, there aren’t many utility customers who want to pay more than they have to for electricity. In other words, power plants that rely on round-the-clock electricity sales can’t compete in a world of zero-marginal-cost solar and wind electricity (the study acknowledges this). 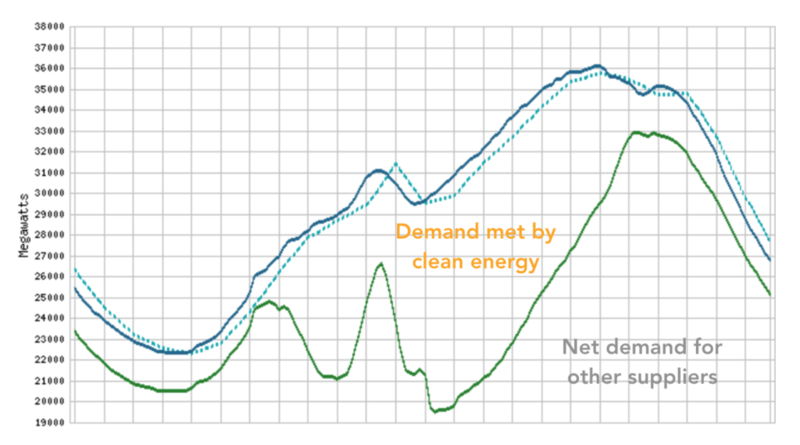 This chart from the California grid operator illustrates shifts in the market. The solid blue line shows total electricity demand, but the zero-fuel-cost renewables (primarily wind and solar) are reducing the total amount needed from the grid, as shown by the green line. What power plant owners need isn’t a round-the-clock electricity generator, but a flexible response to wind and solar energy. The grid needs resources that can follow the green line, supplying power (or reducing demand) when needed, and on short notice. Right now, most utilities have settled on natural gas power plants for that role. There’s been a fairly dramatic buildup in natural gas capacity in the past decade, even amid renewable energy growth (the Department’s study notes this growth, driven by low gas prices, but doesn’t necessarily grasp the longer-term liabilities). In today’s environment, where flexibility is key, inflexible coal and nuclear power plants have been driven to beg for subsidies to continue operation. New gas plants, meanwhile, threaten to become another millstone around the utilities’ necks. The biggest threat to natural gas power plants is the same: cheaper competition. In this case, it’s not wind and solar power individually, but a suite of less expensive tools utility customers and utilities can use to match supply and demand. The first is called “demand response,” and refers to programs allowing utilities to curtail or shift electricity use. Minnesota’s Great River Energy has over 1 gigawatt of demand response in electric water heaters. Xcel Energy Minnesota has 300 megawatts of demand response from radio-controlled residential and commercial air conditioners (and in its latest resource plan was directed to find another 400 megawatts). The much-heralded Brooklyn Queens Demand Management program is finding megawatts in what Rocky Mountain Institute calls “negawatts,” by using distributed energy, energy storage, demand response, and traditional energy efficiency like LED light bulbs. Energy storage, especially paired with solar energy, has the potential to kneecap natural gas power plants that exist primarily to fill the gaps left by variable wind and solar. Many commercial electricity customers have a demand charge (the portion of the electric bill based on a one-hour window of peak energy use each month, and representing half of many businesses’ bills). Solar energy alone is insufficient to avoid this charge, but a relatively small battery can lower that peak. 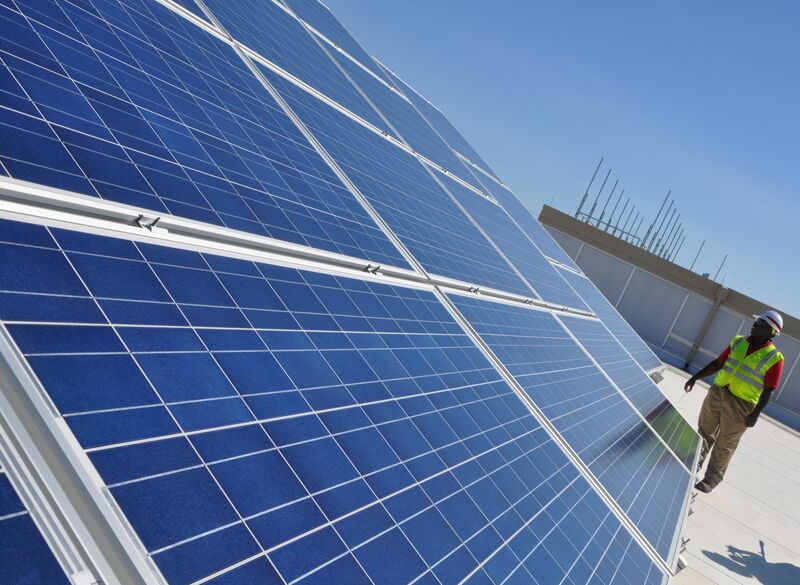 Individually, it means hundreds or thousands of customers can cut their costs — a recent study shows storage can double the savings from solar installations for multifamily housing. Collectively, energy storage and solar will shorten or eliminate periods of peak energy use. In other words, generation alternatives like demand management and customer-sited solar and energy storage will sharply erode the high prices gas generators rely on to meet their revenue requirements. Gas generators face another potent threat: long-term commitments to reduce or eliminate greenhouse gas emissions. To be financially viable, a new power plant usually must remain in service 40 to 50 years or longer. But most international climate change treaties and related state or local commitments require an 80% reduction in emissions by 2050. A power plant approved today (and perhaps not operating for another year or two) will barely have 30 years of operating life before caps on emissions or eroding economics from carbon pricing put it out of business. Thirty years is likely a generous over-estimate of the livelihood of a gas power plant built today. Battery costs alone are falling sharply (shown below), alongside remarkable reductions in the cost of solar energy. Information technology like smartphones and smart thermostats simultaneously give customers new tools for controlling their use. The low cost of wind and solar push traditional power plants into backup duty, but new customer-sited energy generation, storage, and control will continue to reduce the need for backup, with a commensurate reduction in revenue. In other words, new fossil fuel power plants are likely to be stranded assets. 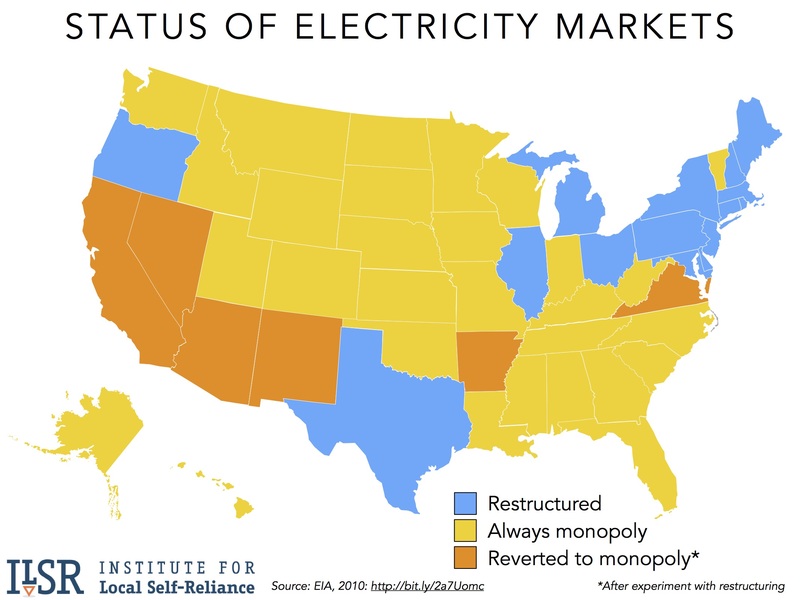 In at least 30 state electricity markets (shown in yellow or orange below), monopoly utilities can hang their failures around the neck of captive utility customers, socializing the cost of poor planning. But being in a competitive state (in blue) hasn’t stopped utilities from seeking bailouts, either. 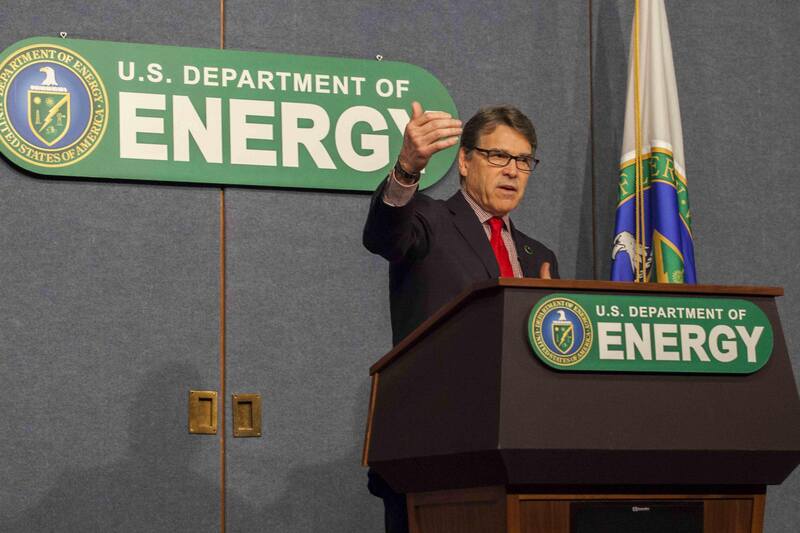 Given its mythical mission, the Department of Energy’s forthcoming grid reliability study is likely dead in the water. But its focus on large-scale power generation ought to open a new and more important line of inquiry: why should utilities build any new fossil fuel power plants when it’s so unlikely they will ever pay off? Photo Credit: U.S. Department of Energy via Flickr.